NOT FAMILIAR WITH TARGET CARTWHEEL? This savings program introduced by Target allows you to save even more when shopping in-store. Even better- these offers can be used with Target Coupons AND Manufacturer coupons for up to a triple stack! You can see my post HERE to help get you started. 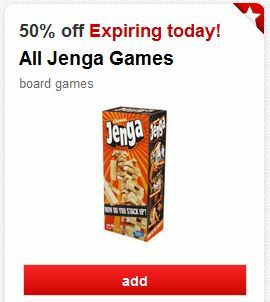 We have a new high value 50% Off all Jenga Games Target cartwheel available this morning. There is a limit of 1 item per guest and the cartwheel is valid thru today, 3/8 only. The classic version sells for $12.99 and Jenga Tetris sells for $11.99 in stores, so as low as $5.99 for Jenga Tetris after cartwheel. 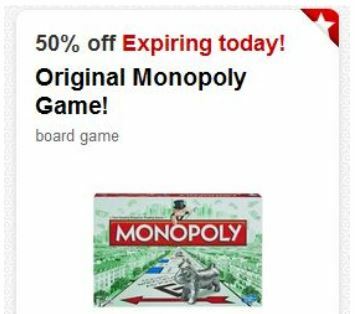 New High-Value 50% Off Original Monopoly Game Target Cartwheel- Valid thru Today 3/6 Only! We have a new high value 50% Off Hasbro Original Monopoly Board Game Target cartwheel available this morning. There is a limit of 1 item per guest and the cartwheel is valid thru today, 3/6 only. This set sells for $11.99 in stores, so it will be $5.99 after cartwheel. Clearance deals can vary from store to store- but take a look around your stores and even if you haven’t seen as big a drop as Mindy- this cartwheel does not expire until 4/5. I would add this Cartwheel now though if you have interest, as they do occasionally disappear before they expire. -Thanks for the heads up & the pic to Mindy! 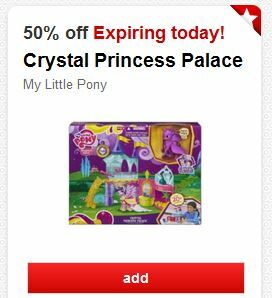 We have a new high value 50% Off My Little Pony Crystal Princess Palace Target cartwheel available this morning. There is a limit of 1 item per guest and the cartwheel is valid thru today, 3/5 only. This set sells for $24.99 in stores, so it will be $12.50 after cartwheel. UPDATE– This cartwheel has now been changed by Target :(. It now reads “34-35 oz” and will no longer be valid to use on the 16 oz jars. 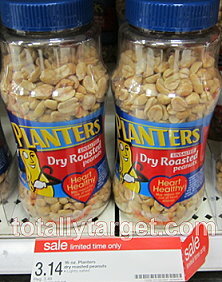 Hurry and grab a nice high-value coupon while it lasts for $1.00 on any ONE (1) PLANTERS Peanuts (Cocktail, Dry Roasted, Dry Roasted Lightly Salted or Dry Roasted Honey Roasted). = $2.24 for 2 or $1.12 each after triple stack! *NOTE- a couple of you have reported having trouble with the cartwheel at checkout- so you may want to watch carefully at the register as the cartwheel is a match for this product. Just a note that the Jell-O Gelatin 3 oz Boxes are also on a Price Cut – for .59 each thru 3/15). Unfortunately there is no cartwheel that matches this size- however- you can still use the 50¢ on any THREE (3) JELL-O Dry Packaged Dessert 3 oz and pay $1.27 for 3 or .42 each after coupon & price cut. New 50% Off Target Cartwheels for Hasbro Games! There are some new high-value cartwheels available this morning on a few select Hasbro Games. Each one has a limit of 1 and there are limited numbers available, so you might want to add them to your cart before they disappear.